Interstate-81 Corridor Study | Resource Systems Group, Inc. 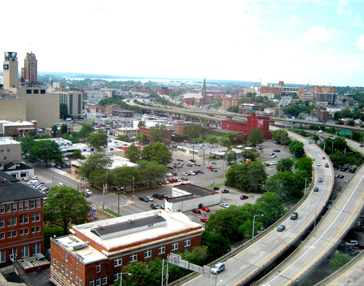 Segments of Interstate I-81 in Syracuse, New York, are nearing the end of their structural lifespan; particularly the most heavily traveled elevated sections through the downtown, which is known as The Viaduct. Over the next decade, significant portions of the roadway will need to be replaced, reconstructed, removed, or otherwise changed at a significant cost. 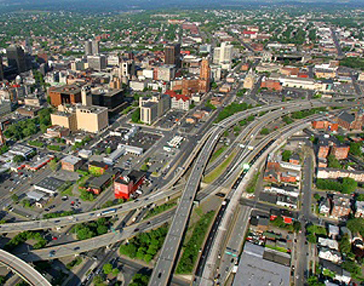 The official decision-making process, The I-81 Challenge, was led by two entities, the New York State Department of Transportation and the Syracuse Metropolitan Transportation Council (SMTC), the region’s metropolitan planning organization (MPO). Together, these two entities are engaging a broad cross-section of community members to develop and evaluate options for the future of this vital transportation corridor. RSG provided travel forecasting services to the SMTC in support of the I-81 corridor study. The work involved a comprehensive overhaul and improvement of the existing regional travel model. Careful refinement and validation of the model was undertaken to ensure the planning tool was ready for application in this extremely important and highly visible study. RSG then used the improved model to forecast transportation impacts for a range of different alternatives, including tearing down I-81 and replacing it with an at-grade boulevard. The project is anticipated to take several years, including an EIS phase, and will involve extensive public outreach.